Two runners for the stable on the Lakeside course at Sandown with The Delphi bidding for a hat trick and Outback Warrior resuming. The Delphi (pictured) has won his last two starts at Sale and is the first to go in race three, the Ladbrokes Benchmark 64 Handicap over 2100m with Harry Grace riding again and reducing the weight to 57kg. Mike Moroney is delighted with the way the son of Makfi is coping with his racing. “We’ve given him a little bit of time between runs and he’s worked well,” Moroney said. “He’s got a bit of a tricky draw today being one from the outside so ideally he’ll be able to get across and get a spot near the speed. Outback Warrior is in race eight, the Benchmark 64 Handicap over 1200m with Michael Poy to ride and reducing the weight to 58.5kg from barrier eight after scratchings. The four-year-old son of Toorak Toff has won two of his four starts and has not raced since finishing unplaced at Cranbourne last August. “The break has helped him and he looks terrific, a lot stronger and a happy horse,” Moroney said. 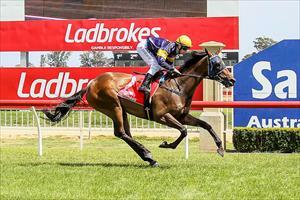 “He’s had two jumpouts to prepare for this and they have both been good.